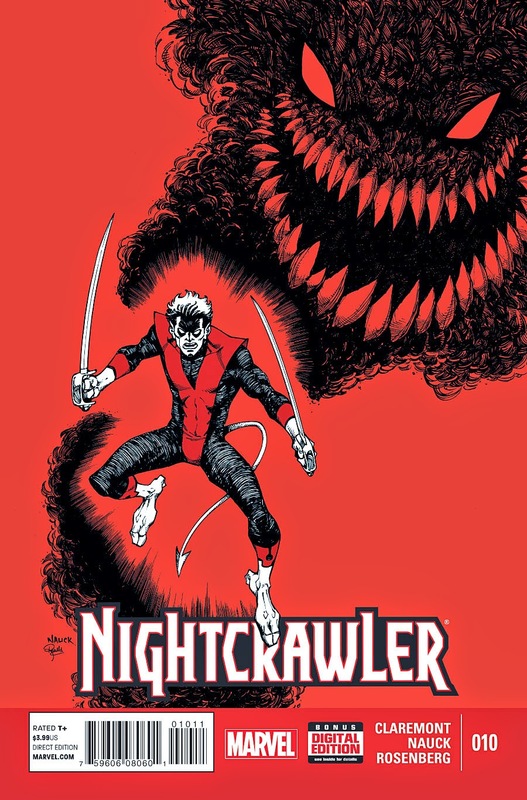 Nightcrawler #10 brings us the continuation of Nightcrawler's struggle against the Shadow King. When we last left off, the fuzzy elf was laid low as the X-Men, the Crimson Pirates, and even the bampfs were all possessed by the Shadow King. Things looked dire, but as always we know a bright outcome must be just around the corner. Nightcrawler #10 continues to be a fun little jaunt. It is nice to see writer Chris Claremont begin to bring together some of the threads he unraveled earlier in this series. In this issue there are some plot points that left me asking a few questions, such as why did the Shadow King did not feel the loss of Psylocke from his psychic grip, as he did for Storm in the previous issue? The use of multiple romantic interests for Nightcrawler seemed odd, but does bring back a character from earlier in the series. The return of certain X-Men to the story, even in the afterlife, was heralded without fanfare, which was also something I found strange given Marvel's recent events around central X-Men characters' deaths. Despite this it was nice to see Claremont hitting the right notes, with key thematic storytelling points. As a series that is now counting down to the final issue, this could have been a good place to leave off, but Claremont seems to be trying to tie up all the loose ends before then. It was good to see Nico and Ziggy turn up in this issue. Prior to reading issue #10, I reread the previous two issues and found myself wondering where they were. 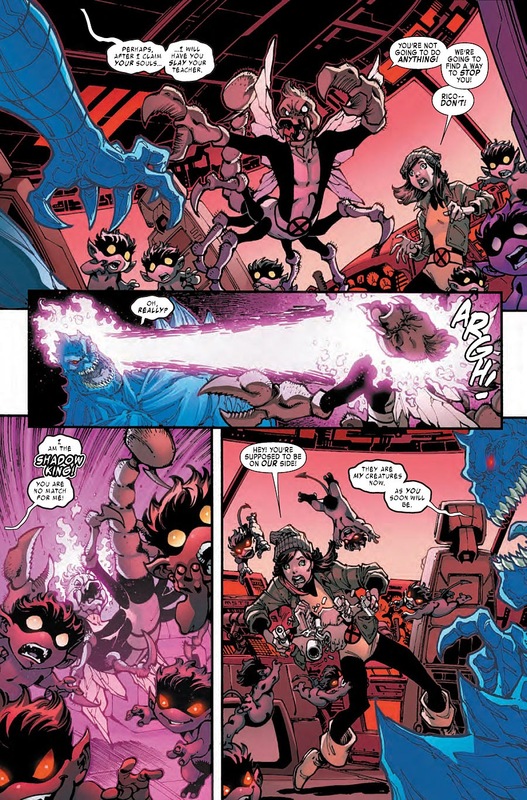 They are crucial for the continuation of the story after this issue, although acts such as Ziggy's manipulation of the gun seemed too convenient, and some of the characters' thoughts or speech commentary came across as a little forced. But this is Claremont's style. Nico and Ziggy are back! On the artistic side of Nightcrawler #10, Todd Nauck and Rachelle Rosenberg continue to hold together a complementary artistic team. This team seems to epitomize a distinct swashbuckling nature in the art, echoing familiar character traits with Nightcrawler. The panel work is fast paced. Nauck has to fit a lot of story into this issue and pulls it off superbly. He has held a consistent approach to the characters and feel in this series; his depiction of Nightcrawler's form in the Astral plane was great. The depiction of the afterlife is vivid and memorable and reminds me of the return of Nightcrawler in the Amazing X-Men. The style and colors from Rosenberg help capture the same essence that was so drawing in the beginning of that series. All in all, this is good way to see a major part of this series wrap up. Claremont keeps us hooked for the next couple of issues, with a nice twist near the end. I am not sure how long the series will keep up before Marvel moves in a different direction, but as long as it is with us, it remains a fun title to spend some time with each month. What did you think of Nightcrawler #10? Do you like the story from Claremont and what he has planned coming next? Leave us your thoughts and post a comment below.